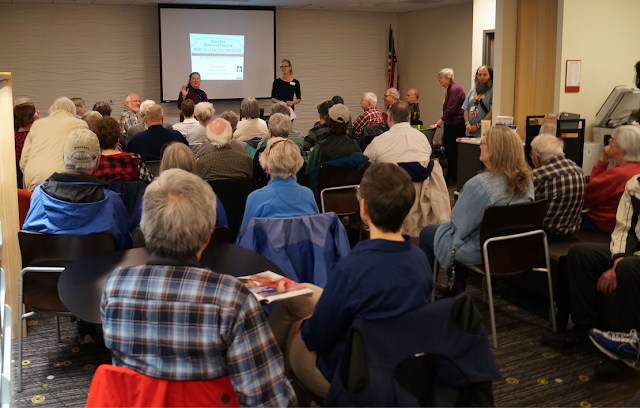 Shoreline Historical Museum Executive Director Vicki Stiles had a packed house for her presentation Saturday, April 6, 2019 on The Amazing History of Lake Forest Park. An overflow crowd filled the small meeting room at the LFP Library and expanded out into the library itself. Vicki started with the Native Americans living in the area before the settlers arrived and brought everyone up to modern times. She covered Lake Forest Park, Kenmore, and Bothell in her presentation. The audience was enthralled, listening with rapt attention to her lecture. The Shoreline Historical Museum is located at N 185th St and Linden Ave N in Shoreline.